Dr. Kaitlin Hawkins graduated with a B.S. from Coastal Carolina University in 2011 and graduated from Southern College of Optometry in May of 2015. There, she was a Beta Sigma Kappa International Optometric Honor Society member and recognized for her outstanding GPA. Dr. Hawkins has completed an ocular disease residency program at the Huntington VA Medical Center in Huntington, WV. She also has completed externships at a private practice in Charleston, SC and at the W.G. Hefner VA Medical Center in Salisbury, NC. 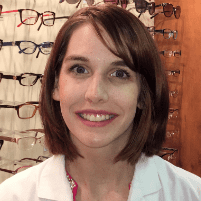 She is a member of the American Optometric Association and South Carolina Optometric Physicians Association. Dr. Hawkins is licensed in Georgia and South Carolina.